A quick search online and you’ll find that the SentrySafe is one of the most popular consumer safe manufacturers in the USA right now. This doesn’t really come as a surprise given the heritage of the brand. However, it doesn’t mean that you shouldn’t slack off. 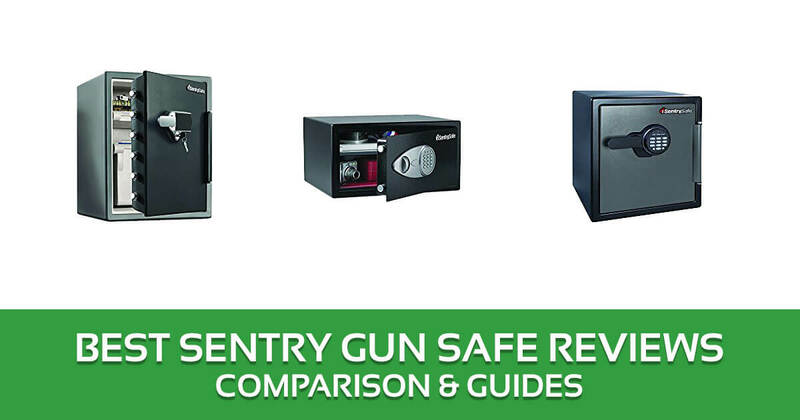 Reading Sentry gun safe reviews is still essential if you want to know more about the product. The best part about researching about SentrySafe is that there are tons of information about the brand available online. This can give you a better idea how the company and their products work, letting you decide whether they’re the best match for you. If you’re really interested in SentrySafe, stick around and learn more about them in this quick guide. 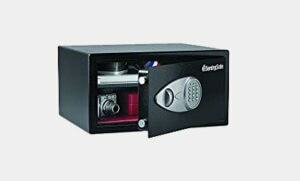 4 Where are Sentry Safes Made? 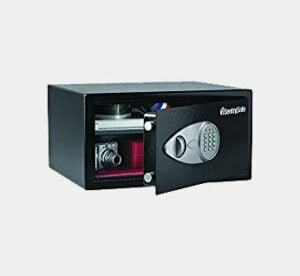 Personal safes like the SentrySafe Security Safe X105 can easily come in handy for so many purposes. They’re very useful if you have to share a space with strangers. Those who have to live in dorms or share apartments with random folks won’t have to keep their eyes on their valuables all the time. What makes the X105 really great is its well-thought-out design. Aside from using solid steel to create a safe space for your belongings, it also has additional details that make it very useful. For one, it comes with an organizing shelf. This lets you get more out of the safe as it will make it possible for you to maximize the space inside. Lots of people also appreciate the carpeted interiors. As this item can fit some laptops, this additional detailing can help prevent scratches, dings, and dents on such an expensive piece of technology. It also has a nice little hole at the back that serves as a power cord access to your devices. It can help you make the most out of your device’s time inside the safe as you can get them fully recharged at the same time. The security features of this unit are also very noteworthy. Equipped with a digital combination lock, you won’t have to worry about not having your key with you all the time. As an additional safety measure, it also has an override key, just in case you’ve forgotten your code or the lock has lost power. If you’re worried that personal safes are easy to carry, fret not. The X105 also comes with a bolt down kit so you can attach it to something heavier to prevent theft. If you’re in the market for a bigger safe that can contain lots of your valuables inside, then you should check out the Sentry Safe SFW205UPC Electronic Alarm Water/Fire-Resist Safe. Offering a 2 cubic feet capacity, it can already squeeze in lots of various items with ease. Making it highly useful is its array of organizational accessories that will let you maximize its space. You can use it with a file drawer and an adjustable shelf which can nicely hold your valuables and documents safely. It also has a door pocket, key rack, and door tray to hold the small things dear to you. In terms of protection, it can keep your items safe from thieves as well as fire and water damage. It’s digital touchscreen lock also has a loud alarm that will create a racket if someone tries to pick up or pry open the unit. It will also go off after 5 unsuccessful attempts of entering the lock’s code. It’s no Sentry Biometric Gun Safe but you might just be able to make it work like one. With its large capacity, you can use gun boxes to place your guns inside. You might even find the very mentioned product to get the job done, just stash it inside this cabinet safe for extra protection. Liked the SFW205UPC but wish it’s ever so slightly bigger to hold two drawers inside? The SentrySafe Fire and Water Safe SFW205UQC might just be a better match for you. This product holds 2.05 cubic feet of space, so it offers just a teensy bit more capacity. It’s just enough to fit an additional drawer inside for your valuables. The SFW205UQC shares a lot of similar features with the SFW205UPC. The main difference between them, however, is the former’s fire rating. Classified with a 1 hour at 1700ºF fire endurance, it can be a more attractive option to those who are after fire and water protection more than anything. If you live near a body of water, flash floods are a constant threat to you even if your area doesn’t always experience typhoons and hurricanes. This is why the need for a safe that can keep your valuables dry and in good shape is a must for many. The Sentry Safe SFW205GRC Electronic Water-Resistant Fire-Safe can be a good match for such needs as this product is water-resistant. Tested by the Electrical Testing Laboratory (ETL) to be waterproof, this unit can guarantee to keep its contents dry despite extreme water exposure for up to 72 hours. Aside from water protection, this item is also fire rated. It has a fire endurance of up to 1700ºF for an hour which can help guarantee the safety of your belongings inside. If you wish to use it as a gun safe, you might be able to make it work. It won’t be as effective for long guns like the Sentry 10 Gun Safe, but it can fit a number of handguns inside. You might just need to find a way to securely place them inside as this unit is designed for documents and other small valuables. With its 1.23 cubic feet capacity, the SentrySafe Fire and Water Safe SFW123EU can be considered as the SFW205GRC’s smaller version. Both have a digital lock as well as water and fireproofing that offers top-notch protection. Like the other SFW models in the list, the SFW123EU is also made of heavy-duty steel with fireproof lining. 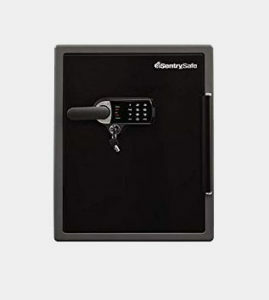 This can guarantee a solid construction that won’t just keep thieves out but will also safely hold your valuables safe from other kinds of damage. Equipped with an adjustable small multipurpose drawer, you can find more use with this small cabinet safe. It also has more storage options on its door, giving you more ways to stash valuables inside. While it’s not a gun safe, you might still be able to use it as such if you’re only storing a few handguns. It’s not entirely comparable with the Sentry Quick Access Gun Safe but it can still do a great job in securely storing a few firearms. An alternative to the SFW123EU is the SentrySafe SFW123GDC 1.23 Cubic Feet Extra Large Digital Electronic Fire-Safe. Both share similar features except for the backlit keypad used in the SFW123GDC. True to the SFW tradition of SentrySafe, this item is also fire and water rated. It has a fire endurance of up to 1700ºF for an hour. As for its waterproofing, it can handle up to 8” of water for up to 24 hours. Its solid, tamperproof construction is also very noteworthy. While it’s not classified as a gun safe, it can still offer a secure space for all kinds of valuables, especially with its water and fire rating. Users also like its adjustable and lockable drawer/shelf. It definitely adds more security and organizational options inside the unit which makes it even handier. If you’ve loved everything about the SFW123GDC and SFW123EU but not a fan of digital locks, then the SentrySafe Fire and Water Safe SFW123DSB is a good option to look into. This item shares similar features with the first two models but with a few more basic alternatives. What makes it simpler is its use of combination lock instead of a digital one. It also comes with a shelf instead of a locking drawer. Aside from these two things, you can already enjoy lots of great things from this unit as you would from most SFW models. You won’t really sacrifice security with the SFW123DSB with its combination lock as it also comes with a key lock. You’ll still need to use the key before turning the combination dial so it can still guarantee your valuables’ safety. One of the most notable things about the Sentry brand is its legacy. It’s a true-blue American brand with its humble beginnings and continuous development. Their story started out in 1930 when brothers in law John Brush, Sr. and Willard Punnett opened the Brush-Punnett Company in Rochester, New York. 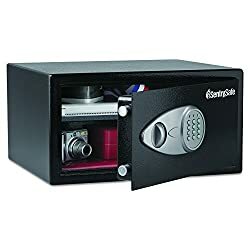 It’s a small shop that manufactured safes that is now considered as one of the pioneers in the creation of stamped steel safes. Times were tough during their early years but they soldiered on and was able to bag business with the Vassar College and Eastman Kodak. In 1955, Brush, Jr was able to buy the interests of his sister and brother-in-law and transformed the company to the John D. Brush & Co.
A little bit more than a decade later, the business moved to a bigger facility to accommodate a heavier workload. SentrySafe didn’t start using the name we all know today until 1987. They made the change so they can be better identified with their trademark name safes known as “Sentry”. The brand continued to flourish through the years and even won awards in the late 1990s and early 2000s. Then, in 2014, it was bought by Master Lock which is one of Fortune Brands’ operating divisions. Being a renowned manufacturer of security products, Master Lock’s acquisition of SentrySafe was seen as a great move to further solidify and improve the Sentry brand. 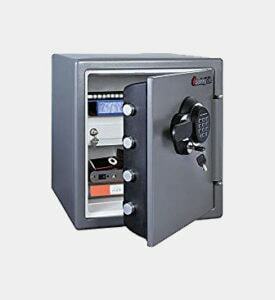 Where are Sentry Safes Made? SentrySafe has always been a proud American brand. However, in 2016, Master Lock decided to move their production to Mexico. This decision even made it to various news outlets as it was made controversial by the ongoing campaigns for the 2016 presidential elections. A company that has been around for decades already know what they’re doing. Reliability is one of the things that you can expect. It’s even boosted by the additional information you can get online about the brand and their products. You can get SentrySafe products from a lot of retailers. They’re available online and at brick and mortar stores, so they’re quite easy to locate. Lots of people may have doubts about the security of safes in general, but when it comes to Sentry’s fire safes, you also get to protect your unit against fire and water damage. That’s a great plus for everyone as all of us have important documents that need complete safekeeping. With their solid, heavy-duty, fire and waterproof construction, SentrySafe products can easily be great options if you need a safe spot in your house, apartment, or dorm for your valuables. The good fire and water ratings alone can already offer you great protection while their dual locking mechanisms can amplify their security against unwanted access. In this roundup of Sentry gun safe reviews, though, it’s quite easy to see that the SFW models are some of the finest options among the selection. They all offer top-notch fire and water protection on top of standard security, so they can definitely come in handy. If you need something for your guns, though, you can check out the specific line for such purposes. 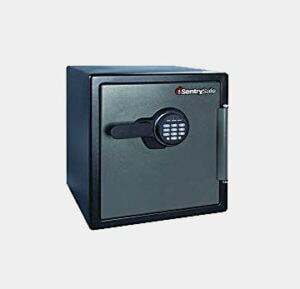 You can find the Sentry 14 Gun Safe and other models suitable for safekeeping your firearms. Some of the websites you come across provide piecemeal information and you are forced to visit another which can take time if you are in a rush. 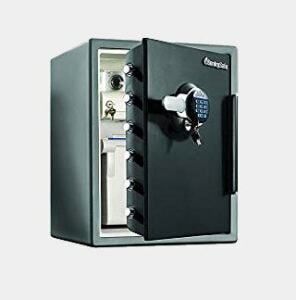 What I noticed in this site is almost everything I needed to know about the Sentry Safe is all here including the functionality. I am budgeting myself and I think this upcoming summer I would buy the one. 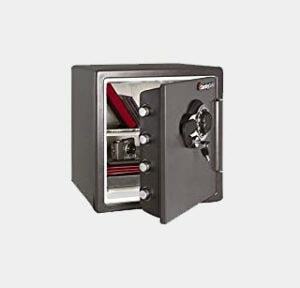 The Sentry Safe is a legend brand.